Bob Dylan has included biblical truths in his music for years. For those who take time to listen it can be heard in his lyrics quite often. The objective of this site is to point people to the truth and love of God, forgiveness and freedom found in his grace through Jesus. You can find light in the darkness. Consider this a place to reflect in the midst of a world gone wrong. Bob Dylan - Messianic Jew from maozisrael on Vimeo. "Even as I travel the cities, I‘m more at home in the vacant lots. But I have a love for humankind, a love of truth, and a love of justice." "You have to show people a side of themselves that they don't know is there." A question people ought to be asking is: Where is his voice most clear? "Everybody knows by now that there's a gazillion books on me either out or coming out in the near future. So I'm encouraging anybody who's ever met me, heard me or even seen me, to get in on the action and scribble (that means write carelessly or hurriedly) their own book. You never know, somebody might have a great book in them." Bob played a lot of old songs on Theme Time Radio Hour. That would make something recorded around . . . say . . . 1980, not that old at all and still quite relevant and timely. Some high sounding people could say Bob Dylan doesn't "go to church" as we know it. First, Bob is in a unique position of influence with many an eye on him and critics ready to say . . whatever. Second, how do you know? Who says we have to? Jesus said wherever two or more are gathered in His name, there He is in their midst. It could be family, it could be friends, it could be . . whoever. What matters is what Jesus says. Doing "worship" does not have to be in the cubicles of man made tradition when extraordinary times call for the cleverness of a fox while maintaining the innocense of a dove. Jesus taught that, too. Bob closed many of his concerts in recent times with Thunder On The Mountain and Ballad of A Thin Man and still sings them toward the end. If you don't see any connection at all to his faith, well, maybe you should put on some weight. MIKAL GILMORE: Clearly, the language of the Bible still provides imagery in your songs. BOB DYLAN: Of course, what else could there be? (emphasis added) I believe in the Book of Revelation. I believe in disclosure, you know? 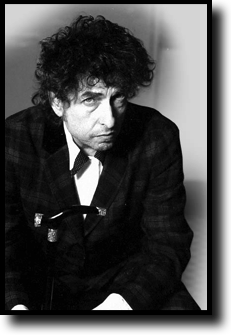 Hints, Allegories and Mysteries – Insight Into Some of Dylan's Methodology? "No kind of life is fulfilling if your soul hasn't been redeemed."